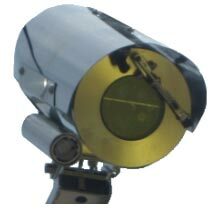 IceSight IceSight 2020 is an electro-optical sensor which reports the surface weather condition of roadways. IceSight will detect Ice, Snow, or Water without ever having to touch the surface it monitors. Easy pole-mount installation of the IceSight eliminates the need for penetrating the roadway as other surface sensors require. IceSight's high sensitivity enable it to warn road management personnel immediately when snow or ice begins to form, allowing them to take action before roads become hazardous. The IceSight has been through 5 years of intensive field evaluations with IDI customers and has proven accuracy and effectiveness as a non-contact road condition sensor. The sensor also features a unique cleaning system eliminating the high maintenance requirements of similar products.